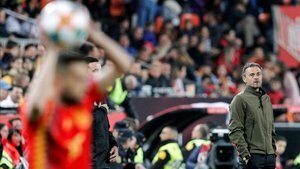 Luis Enrique: "We deserved to have won 5 or 6-1"
Spain coach Luis Enriqiue was a very happy man after his side secured a 2-1 victory over Norway in the first Euro 2020 qualifer. "I'm happy with everything, although we deserved to have won 5 or 6-1, but football is a sport which only rewards those who score goals." "You have to value all the positives from this team and Norway made it difficult, and made us suffer until the end," explained Luis Enrique. "We have learnt what it means to suffer in order to win. We should have won by a clearer margin but we're happy with the three points and to carry on moving forward." Luis Enrique finished by praising his squad's worth ethic. "We're happy with the attitude of our workers, who have worked hard all week, in order to generate the chances we did against our opponent. Maybe that was the only area where we weren't effective. Because if the chances are created but we don't score, we have to improve there."